Heat oven to 350F. Spray 12x8- or 11x7-inch (2-quart) glass baking dish with cooking spray. In 10-inch skillet, cook beef, onion, chili powder, cumin, salt and pepper over medium-high heat 5 to 7 minutes, stirring occasionally, until beef is thoroughly cooked; drain. In medium bowl, mix Bisquick mix, eggs and milk with whisk until only tiny lumps remain. Pour half of the batter into baking dish. Sprinkle with 1 cup of the cheese. 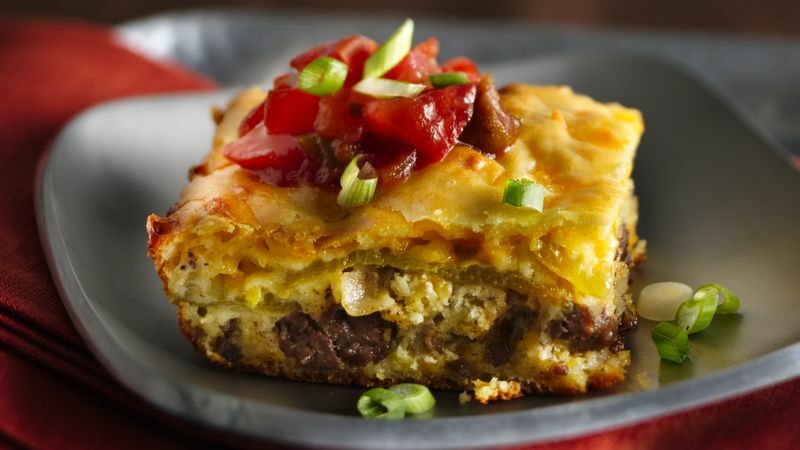 Spoon beef mixture evenly over cheese. Using paring knife, cut lengthwise slit down long edge of each chile; open and arrange flat on beef mixture, overlapping if necessary. Sprinkle with remaining 1 cup cheese. Pour remaining batter on top to cover. Bake uncovered 25 to 35 minutes or until topping is light golden brown. Serve with sour cream or salsa…or both! Try a Mexican cheese blend instead of the Colby-Monterey Jack.